If you’ve ever traveled with a baby, you know it’s not easy. Babies don’t care much for your travel schedule; they want what they want when they want it. That’s where having the perfect stroller travel bags come in. Imagine having everything you could possibly need right for your little one right at your fingertips. It would certainly make traveling a little easier. Easily washable. Travel can be dirty enough but everything is a little messier when there’s a baby involved. Between dirty diapers, spit ups, and all the germs you pick up traveling, being able to throw your bag in the washing machine makes things really easy. At the very least, make sure you can hand wash it and that spot cleaning is easy. The more pockets, the better. When everything has a place, you’ll always be able to find what you need quickly. Another thing to check for is if there are pockets for your things. Ideally, you’ll have a secure pocket for your keys, wallet, and cell phone. Versatile. Most designs can be used as a stroller bag and also be converted to a backpack. Some can even be carried as a crossbody bag or a tote. That means you’ll be able to take it just about anywhere and you’ll get a lot of use out of it even when you aren’t using your stroller. Now that you know the basic things to look for in a stroller travel bag, let’s take a look at the top five bags. 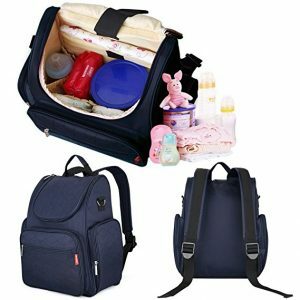 These bags are all perfect for any kind of travel and will make your adventures with your baby more enjoyable. The bag from J. Giovanni is the perfect balance of style and function. It has heavy-duty, double polyester lining that’s machine washable. That’s not all; it’s also water-, wrinkle-, and mildew-resistant. This is truly a bag that can go with you just about anywhere and will last a long time. The wide, comfortable straps let you carry it on your back with ease and it easily attaches to your stroller when you need a break. One of the best things about it is the number of pockets it has. There are 12 in all and they vary in size so there’s a place for everything, including a pocket specially designed for dispensing baby wipes and one that’s insulated to keep bottles fresh. It even includes a free changing pad so getting your little one into fresh diapers on the go is a piece of cake. And that’s not all: it also comes with a money-back guarantee. Another stylish and versatile option is the Mini Me Diaper Bag. You can use it as a backpack, tote bag, or stroller bag. The special double zipper design allows you to open the bag nice and wide so you can get everything you need in a hurry. It’s made of water-resistant nylon and even comes with a matching changing pad. When it comes to pockets, this bag delivers. The main compartment is really roomy and perfect for spare clothes, baby blankets, or diapers. There’s also an insulated pocket on the front of the bag that has room for 3 bottles. 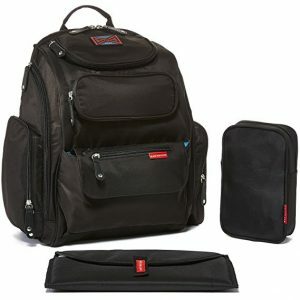 It also comes with four elastic pockets and a key strap so you can keep everything organized. When it comes to pockets, this bag from Baby Bandit delivers. Believe it or not, it has 16 pockets in all. This includes two large zipper compartments, an easy access baby wipes pocket, and five insulated pouches to keep bottles fresh. There are even hidden pockets where you can keep your wallet, phone, and passport for safe keeping. If you want to stay decluttered while you travel, this bag gives you a lot of ways to do it. 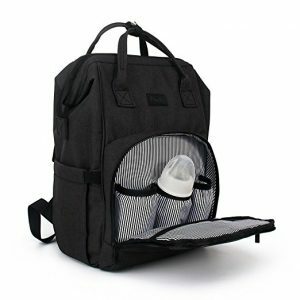 You can carry it on your back using the comfortable padded straps, with the top handle, or attach it to your stroller. 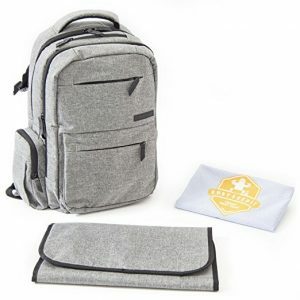 It includes a waterproof changing pad as well as a travel sack for easy carrying. While it’s not machine washable, it is really easy to spot clean and you can hand wash it when needed. Here’s the best part: it comes with a lifetime warranty. 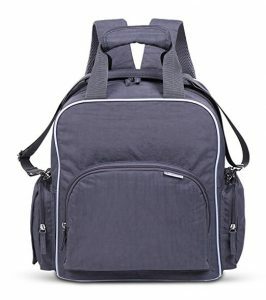 Bag Nation makes a great diaper bag that can be carried as a backpack using the comfortable straps or easily attached to your stroller when you want a hands-free option. There are 14 pockets in various sizes so you’ll have room for big things like diapers, bottles, and spare clothes as well as small pockets for pacifiers and small toys. Plus, it comes with an extendable key chain holder as well as a pocket for easy access to baby wipes. The twill polyester material is stronger than cloth and won’t fray. It’s lightweight and durable, perfect for moms and dads. Plus, it even includes a durable changing mat and a sundry bag. This is such a versatile bag and because it comes with a lifetime warranty, you’ll be using it for years to come. This MBayshore bag can be carried as a backpack or attached to your stroller. You can also adjust the straps and carry it as a crossbody shoulder bag or carry it by the comfortable top handle. There are plenty of pockets, including a large main compartment, a wipes dispenser, and zippered pocket that makes the perfect place for keys or to tuck that pacifier so you know right where to find it. It’s made of water-resistant polyester that’s easy to wipe clean and can withstand sun exposure, perfect for days at the beach or any other outdoor adventures. It comes with a 30-day money-back guarantee. If you don’t love it, send it back for a full refund.